Calling all trappers! Trappers who catch gray fox this season are asked to contact the Ohio Department of Natural Resources, Division of Wildlife if gray foxes are caught. 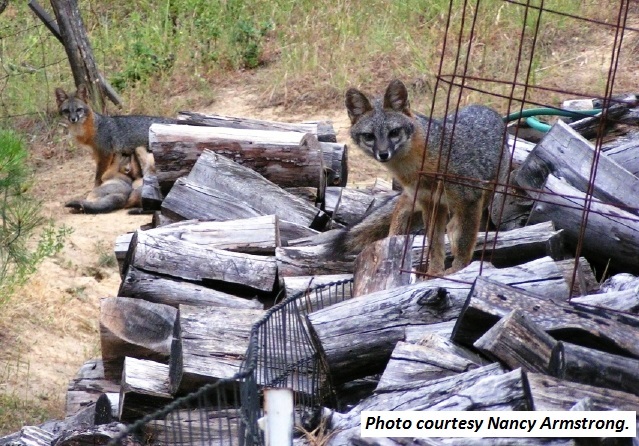 The Division of Wildlife is pursuing a gray fox study and requests the help of trappers in capturing study animals. Foxes caught that are deemed suitable for collaring and release will receive $40.00. NOTE: Only gray fox caught in the following counties are eligible: Athens, Belmont, Coshocton, Gallia, Fairfield, Guernsey, Hocking, Jackson, Lawrence, Meigs, Monroe, Morgan, Muskingum, Noble, Perry, Pike, Ross, Scioto, Vinton, and Washington. Trappers should contact Suzie Prange at 740-590-3138 or John Sisson at 740-288-5093 as soon as you can to make arrangements for data gathering, collaring, and release. Photo courtesy of Nancy Armstrong. For those of you reading this that aren't trappers or aren't as familiar with gray fox, here is some additional information. Gray foxes (Urocyon cinereoargenteus) are one of 3 wild canids living in Ohio (coyote and red fox being the other two). Like its cousin the red fox (Vulpes vulpes), the gray fox is smaller than a coyote but larger than a male house cat. Gray foxes however, are slightly smaller than red foxes, and have fur coats of gray, black, and white rather than the familiar red of red foxes. Red fox (shown here) are found more often in open habitats, such as fields, meadows, agricultural areas, and even urban environments. Gray foxes frequent mature woodlands and brushy areas, hunting rabbits, mice, voles, and other smaller vertebrates. Fruit and invertebrates also make up a substantial part of their omnivorous diet. Their ability to climb trees, unique among canids, allows them to greater access to their prey. In Ohio, gray fox populations have been declining, causing state biologists to ask why. Before answers can be found, gray foxes must first be caught, and trappers can help! The intent is to fix gray foxes with radio collars, allowing researchers to track their movements and gain insight into Ohio's gray fox population. Again, contact Suzie Prange at 740-590-3138 or John Sisson at 740-288-5093 if you are interested in helping.